Are you wondering what happened to the “chicha” in Chichajo? Chicha stands for my love for chicharon and all things piggy (literally and figuratively)…like bacon, ham, slow-braised pork belly, roasted suckling pig, and all that go in that direction. This also stands for my dangerous liaisons with food that is not exactly good for me: Bone marrow, foie gras, burnt animal fat (you know, that bit at the end of a roast), butter, mayonnaise, egg yolk. Lately, I have humoring my healthy side…indulging in fruits and vegetables and yogurt and granola (all of which I also love). High time to shake things up a little as the “chicha” in me has been clamoring for some action. So I appeased her with this – my slightly Spanish version of an English breakfast. I wasn’t bashful in the fat department when preparing this, so if you are in any way squeamish about fat and calories and cholesterol, please go no further! Stay here or here and we’ll call you back when it’s safe! The first time I had an English breakfast was, aptly enough, in London. I was visiting my good friend Christine. She was based in London at the time, and I had just come from Finland. It was my first time to live on my own and away from home. I was thrilled with the freedom and discovery, but work weighed heavy on my shoulders as I fought to learn the ropes far from any support system. Thank goodness for Christine! She was a major lifesaver (still is) during some very anxious times. There were many things she did that cheered me up (and on!) and one of them was preparing an English breakfast for me. A full English breakfast is a lollapalooza of breakfast proteins and starches (and fat), heaped together on a plate – substantial, zany, unapologetic, and in my book – awesome! Sure you can start with the backbone of bacon and eggs, but for me, the more over the top the better! Yes to the beans and the blood sausage! Yes to toast and hash browns! Fry it up and pile it on! In that spirit of everything goes, I threw together this version. I had some leftover fabada (a Spanish bean stew) with I used for the beans element. Since my fabada had bacon slab, chorizo, and morcilla, I figured that covered the bacon, sausage, and black pudding. Instead of hash browns I used leftover roast potatoes (from a roast chicken dish) which I refried in olive oil with shallots, red pepper, and olives to stay within the Spanish theme. I then fried an egg in some chorizo oil**, smooshed everything onto a plate with a small baguette, and dove right in! 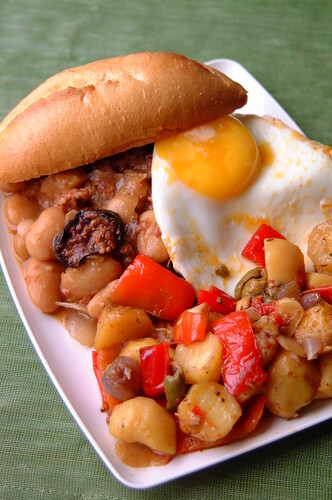 This type of breakfast is an excellent way to use leftovers, like I’ve done here with the beans and potatoes. It is also the type of breakfast that works great if you are in need of major fortification. Or cheering up. Or if it’s a Sunday and you want to be lazy and piggy 🙂 And it does wonders for a hangover. **What is chorizo oil? When I make fabada (or fry up chorizo) a lot of deep red, aromatic oil from the chorizo floats up. Normal people would skim this off and toss it. But I’m not normal people. I keep it in the fridge and fry eggs in it. Waste not, want not.